As a kind of grand finale to 20th Century Fox’s CinemaCon panel presentation, which featured a Las Vegas retinue of dancing girls — and a guy dressed in a Deadpool mask and knee-high patent-leather boots high-kicking and twirling — as well as an orchestra playing the studio’s horns-and-violin fanfare, Fox unveiled one of its heretofore under wraps projects: the Queen biopic Bohemian Rhapsody. Left totally unmentioned during the presentation was Bohemian Rhapsody’s director: Bryan Singer. In December, Fox fired the hit-making X-Men filmmaker after his repeated absences — what the studio termed “unexpected unavailability” in a piquant statement — forced a halt to production. Days later, Singer was replaced by Dexter Fletcher (Eddie the Eagle), who finished shooting the film (due in theaters November 2) and, similarly, went without being named at the CinemaCon panel. In the exclusive CinemaCon clip, Malek bears a startling resemblance to the preening front man whose charisma and multiple-octave, operatic singing voice electrified audiences worldwide. 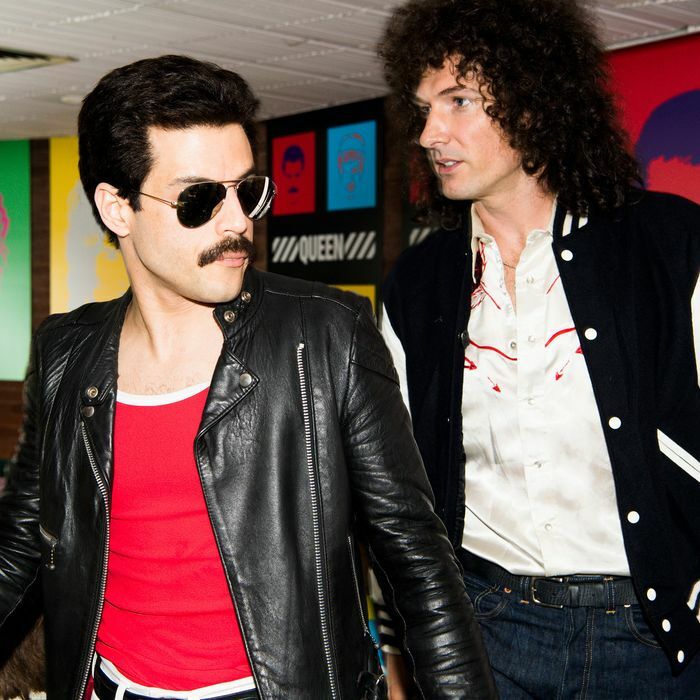 Following a rough chronology, we see Mercury as a scruffy young upstart who initially gets rejected when he asks to front Queen — “Not with those teeth, mate,” a band member says — evolving his style into a more rough trade aesthetic, on through the recording of the movie’s freewheeling, operatic title song. Queen’s iconic songs, such as “We Are the Champions,” are heard throughout. And in one particularly remarkable moment, Mercury strikes a pose of triumph in front of a crowd of tens of thousands of people at 1985’s Live Aid concert in London’s Wembley Arena — widely regarded as Queen’s single greatest performance.